If you have a hard time deciding which pressure washer to buy, then just go for something in between. And that would be the best 3000 PSI pressure washer! Sometimes, we just can’t decide which pressure washer type to buy: electric or gas? Also, we need to decide which PSI level to choose. If you have a hard time choosing the best pressure washer for you, the best move is to find a unit that is versatile and multi-functional. There are actually a lot of pressure washer options in the market today which can be used in various cleaning applications. 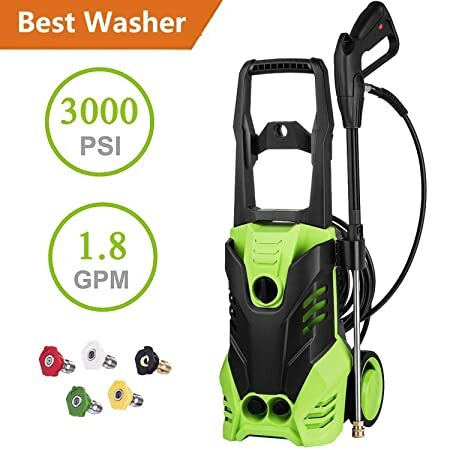 So, whether you are looking for a cleaner that is gentle enough for washing cars or you want a powerful unit to handle stubborn dirt and grime, the best 3000 PSI electric and gas pressure washers are excellent cleaners to start with. Check Out The Comparison Table Below For A Quick Run Through Of The Best Units On The List! You know you got yourself a great cleaner with Schafter ST5 pressure washer 3000 psi electric pressure washer. A powerful yet compact pressure washer that is an all-rounder, Schafter ST5 has easily won the hearts of many homeowners. Thus, it is not at all surprising why this pressure washer has great feedback in many 3000 is power washer reviews. 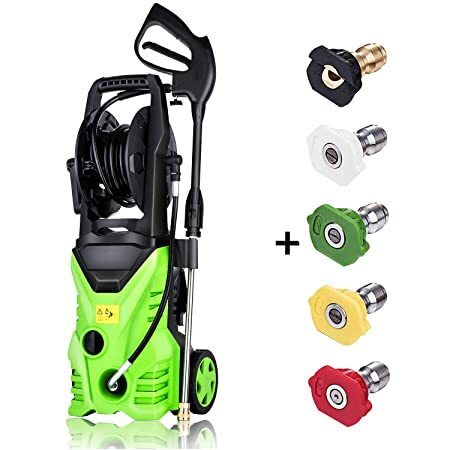 Enjoy a maximum cleaning power of 5,280 CUs if you use this amazing pressure washer. In terms of motor, Schafter is powered by an 1800-wattage motor with 60 Hz, a good spec combination for residential purposes. This unit comes with different pressure washer accessories and a metal gun attachment. It also has a TSS feature that helps save energy and prolong the pump life of the machine. Instead of four, this one offers 5 interchangeable nozzles that are composed of low and high-pressure nozzles. With an IPX5 rating, this unit is proven to be waterproof and can be used with water temperature up to 40 degree Celsius. This also receives a CAS certification, which is considered as one of the most reliable product testing services. The materials used in this pressure washer are a combination of plastic and metal (mostly plastic). Thus, extra caution must be observed when using the unit. The 3000 psi power washer hose that comes with the unit is really short, only 6 meters. This Flagup 3000 psi electric pressure washer is another favorite by many homeowners. 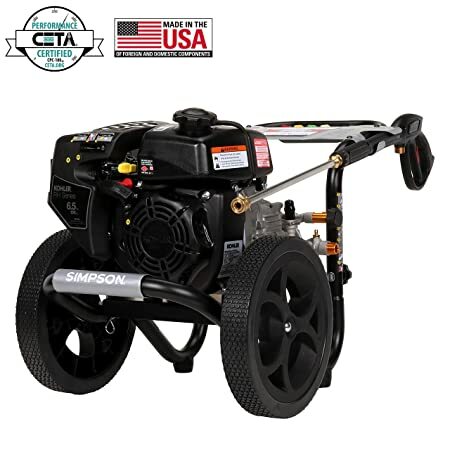 This best-selling 3000 psi powerful electric pressure washer offers the best value to your money. It is affordable but doesn’t fall short when it comes to performance, accessories, and durability. It has a maximum flow rate of 1.8 GPM and a psi level of 3000 psi, thus giving you a great cleaning power of 5,400 CUs. This can be considered as 2-in-1 medium-duty and heavy-duty cleaner. It has the look and features of a medium-duty cleaner but can function as a heavy-duty cleaner when partnered with the right pressure and attachments. A multi-functional unit, Flagup 3000 psi electronic pressure washer high pressure washer is great for cleaning vehicles such as cars, boats, RVs, SUVs, and ATVs. No more back pain as this unit has an ergonomic design. It has a pistol style grip and easy roll-away wheels to help you maneuver the unit on any surface. It also has an IPX5 protection rating. With 5 interchangeable nozzles that are perfect for both low and high-pressure washer cleaning. As part of its safety precaution features, it is also equipped with TSS or Total Stop System. The pump automatically shuts off if the cleaner is at idle. You cannot use surface cleaner attachment with this one. You need to turn off the motor after 3 hours of cleaning. This is a bit of a hassle but for safety reason, this must be followed. 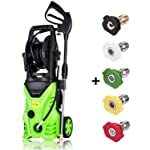 There’s no doubt that Rendio is one of the most coveted and best 3000 psi electric pressure washer on Amazon right now. And that is for some reasons. This 3000 psi pressure washer, in particular, is the brand’s best-selling unit. It’s a great cleaner for residential use that is packed with power and is known to be very affordable. With a psi level of 3000 PSI and a maximum flow rate of 2.4 GPM, you’ll have a cleaning power of 7,200 CUs, which can be categorized as a medium-duty cleaner. A quick look at some of the Rendio 3000 psi electric pressure washer reviews, and you’ll know why this cleaner is loved by many. The best thing about this unit is that it is multi-functional: great for cleaning cars, decks, patios, driveways, etc. 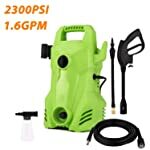 Users believe this is the best 3000 psi electric power washer. Despite its small size, this is actually a powerful cleaner with an 18-watt motor. It has a TSS system, which automatically shuts off the 3000 psi power washer pump when the unit is not in use to save energy and prolong pump life. If you use a turbo nozzle, this pressure washer unit can blast away stubborn dirt effectively just like the heavy-duty pressure washer. This receives an IPX5 rating, which means that the unit can handle a water temperature of up to 40 degrees Celsius. Comes with 4 interchangeable nozzle tips, both low and high-pressure nozzles. It’s a great product for its price, but if you’re looking for something that can last for a long time, then this is not the best option for you. If you want a heavy duty 3000 psi pressure washer, then Simpson Cleaning is a brand that you should definitely consider. The MegaShot 3000 psi from the Simpson Cleaning brand is a great choice for 3000 psi gas category. This makes use of a KOHLER engine that produces a maximum cleaning power of 7,200 CUs. Well, that is because of its 300 psi and 2.4 GPM flow rate. The KOHLER RH265 engine os this unit is ideal for residential cleaning, whether for decks, patios, driveways, etc. The unit is built with a steel frame which has two functions, protect the engine from impact during operation and to allow easy carriage of the unit. Comes with 12-inches wheels that never go flat. If you are wondering about the unit’s pump, this has an axial cam pump. Triplex and axial cam pump are two best pump types for pressure washers. The pump is also easy to maintain, thanks to its OEM technologies. It has M22 connections that are kick-free and abrasion resistant. The pressure washer hose that comes with the cleaner is non-marring and really flexible. This is really huge and bulky. You can tell that it takes up so much storage space. 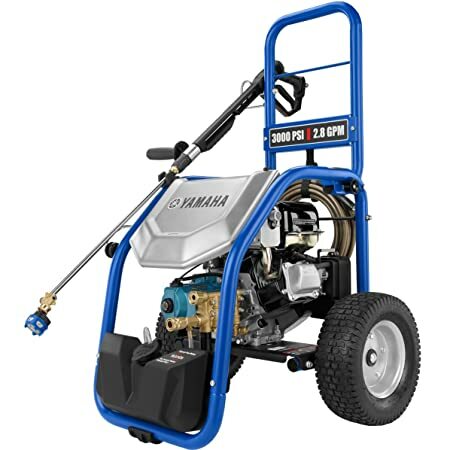 Yamaha 3000 psi gas pressure washer is also a powerful gas cleaner but with a more compact and lightweight design as compared to the Simpson MS60763 MegaShot machine. Want a more compact yet heavy-duty gas 3000 psi pressure washer? This is the best pressure washer for you! Powered by 3000 psi and an impressive 2.8 GPM flow rate, you’ll have a maximum cleaning power of 8,4000 CUs. Isn’t that amazing? The Yamaha 3000 psi power washer has a massive fuel tank. This means you can use the unit for hours without interruption. The 3000 psi power washer pump of this unit is the dependable CAT pump. CAT pumps are known to be the pump of choice by most industrial cleaning applications. Users of this cleaner said the unit is really durable and very powerful. Comes with an adjustable spray wand that allows you to manage the flow of the water to your cleaning needs. Its tires are solid and durable, perfect for uneven terrains. This one is priced a bit higher than most 3000 psi gas pressure washers. The warranty of this product is a bit confusing. Please make sure to check with the seller first. Others say the seller shoulders the warranty while others say its the Yamaha dealership that is responsible for the engine warranty. A versatile 3000 psi pressure washer cleaner is what Powerstroke PS80544B is known for. It’s a great power cleaner for residential purposes that is equipped with great features. It is powered by 3000 psi and 2.5 GPM flow rate. Moreover, it has a compact and modern design that a lot of people seems to love. It has a reliable 212cc OHV engine that produces a strong water pressure. The high pressure easily gets rid of stubborn dirt, mildew, and grime. The detergent tank of this machine can hold up to one gallon of detergent. With excellence in mind, the manufacturer of this unit made sure to use 12-inches flat-free wheels. The wheels also have great traction for slope and uneven surfaces. Comes with a pressure washer hose, trigger gun, and wand. Nozzle attachments? Sure, this one includes 4 pro-style spray nozzles that are ideal for various cleaning applications. Assembly of this machine may be a bit difficult for first-time users. You must be careful when filling the oil to avoid making a mess. So, which 3000 psi pressure washer is the best option? Well, the answer is actually subjective. It depends on your cleaning needs. If you need more power, go for the 3000 psi gas pressure washer. And the best choice for me is the Simpson Cleaning MS60763 MegaShot. Yes, it’s bulky but the power and efficiency it offers are unmatched. 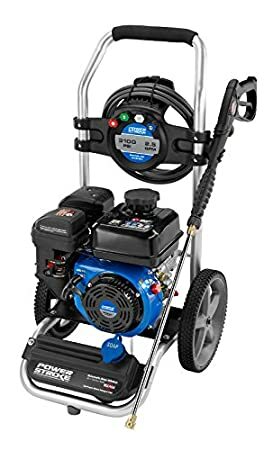 On the other hand, for the best 3000 psi electric pressure washer, I’d recommend the Rendio 3000 psi electric pressure washer​. This is the hottest 3000 psi cleaners at the moment. It’s compact yet powerful and easy to use. Hope you find this article helpful. If you still haven’t found the best pressure washer for you, click here to find the best pressure washer that matches your requirements.